I'm sure many of you might be wondering where in the world I came up with this combination? Well, my inspiration of this recipe came from a Lamb burger recipe I found on our Samsung TV! Believe it or not, one of the apps built into the TV had dinner recipes on it, and they had a recipe for Lamb Burgers stuffed with Mozzarella cheese (looked SO good). I couldn't remember the recipe when I was at the store, so when I got home, I couldn't make the Lamb burgers, so I decided to improvise! This is the result. I call it an Eggplant and Lamb casserole. Without a doubt, this was one of the most satisfying dishes I've made in a while - and it was on a whim that I decided to combine these ingredients, partly because I didn't have the right ingredients for the burgers AND I had an eggplant that if I didn't cook it, it would have gone bad... so, win-win! Give it a try, you'll be so happy you did! 2-3 tbsp of dried parsley, or if you have fresh USE FRESH! Slice the eggplant long-ways in about 1/4" slices. Place on cookie sheet and coat lightly with olive oil. Salt & pepper both sides of the eggplant, and put in a 450 deg F oven for about 15 minutes. 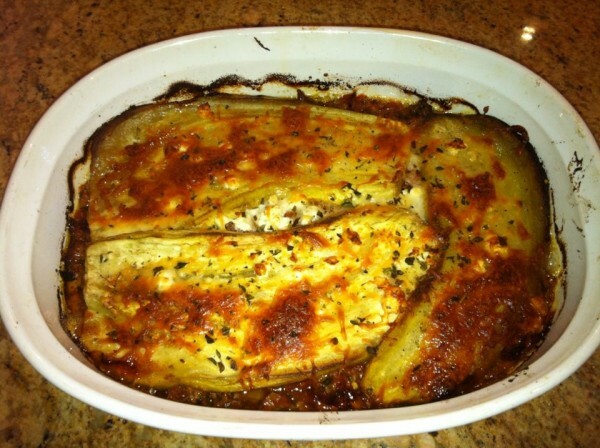 You're looking to roast the eggplant, but not cook it to death. Flip the eggplant about 1/2 way thru the cooking time. If you notice that the eggplant is becoming too floppy, take it out, it's ready. Brown the lamb in a heavy bottomed sauce pan. When the meat is browned, add the fresh Rosemary, parsley, oregano, and cook a bit to release the flavors. Squeeze some fresh lemon juice on the meat mixture and scoop out with a slotted spoon into a small bowl (this way you don't get all that fat in your dish). Once it has cooled a bit, add the Feta cheese to the meat mixture. Grab yourself a small casserole and butter the bottom. Start with a little of the sauce on the bottom, then put a single layer of the roasted eggplant, cut the eggplant if you need to so that you get an even layer. Put a layer of the Lamb mixture. You get the idea... keep making layers until the last layer is the eggplant, to cover the whole thing up. Put back in the 450 deg F oven for about 15-20 minutes or until the top is brown and the whole mixture is bubbly. You will be able to smell this all over the house! !